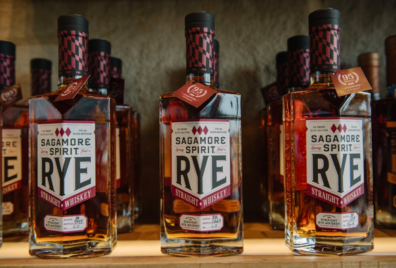 When entering the new Sagamore Spirit distillery, you begin inside the rectangular visitors’ center, where the Kevin Plank-owned company presents the history and what it hopes is the future of rye whiskey. The past can be seen through an interactive touch-screen that illustrates Maryland’s rich history with the spirit, and a centerpiece of old glass bottles by local brands that have come and gone. Sagamore’s ambitious future can be seen for sale everywhere else: apparel (branded with Plank’s Under Armour logo), spicy barbecue sauce and neat rows of rye whiskey bottles.